Check out Twinings offer for a sample of 3 teas! They also have a Tea of the Month club that seems really reasonably priced! You get 2 boxes of tea each month at an average price of $5.00 per month. You can order a 6-month or 12-month subscription. Thanks to Meredith for telling me about this deal! My brother is visiting this week and he usually works hard on our slow basement remodel so I like to make bigger, meatier meals to accommodate him. This week Albertsons had some good deals on cereal, Kleenex, and Lysol wipes. Here's the cereal I picked up on Monday night. Ten boxes were $15.34 after the sale and MC and I got a 16oz tub of sour cream for $1.50 that didn't make it into the picture. 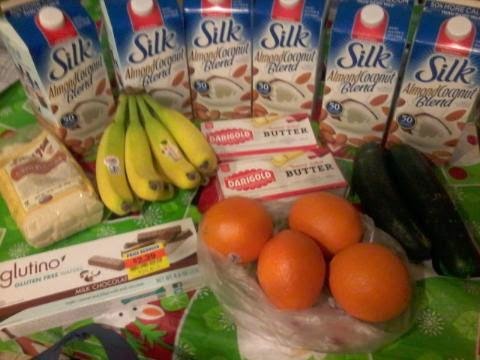 $16.84 total on food. This was another dash into Albertsons before the cereal sale ended Tuesday. 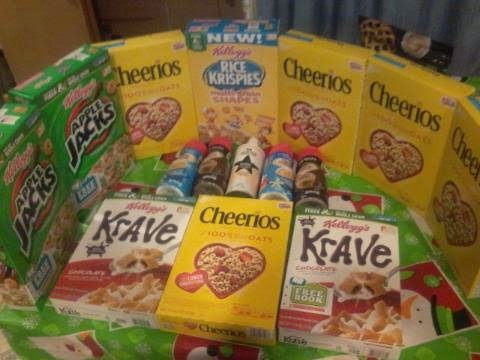 I had more coupons for this batch of cereal so it was only $13.90 for all ten boxes. The creamer was on sale for $0.99 and I had $1.00/2 MCs so they were only $0.49 each! I also got 4 markdown cinnamon rolls for $0.99 and a picked up whipped topping at Dollar Tree and put in the photo here. It was $17.85 including the Dollar Tree stop. This was a big shopping trip at Fred Meyer. We were getting ready for lots of baking and I was missing one ingredient from our four main recipes. So we got corn syrup, marshmallow crème, and pecans along with all sorts of other goodies that were a great price. I also picked up frozen tater tots & fries, and some corn tortillas for some frozen dinners I want to make. I also got a big bag of Stevia - trying to be healthier. I spent $60.95. I really need to go the store again, but I was out of town all weekend. Maybe tomorrow. I spent a lot again this week, but I put lots in the freezer and stocked up the pantry. I went to Fred Meyer and found all sorts of clearance stuff in addition to the few things I needed for company. I can't find my receipt! But I don't think I bought any paper goods on this trip and my bank/debit card says $26.54. I stopped at Albertson's late one night after helping with some babysitting at church. I scored $0.50 relish and $0.99 breakfast sausage! In total this trip was a meager $10.92. Another quick stop at Albertson's while 2 littles were at therapy yielded some clearance yogurt & bagels. I spent a whopping $2.99. Another quick stop at Safeway when I was out late one night. I wanted the $0.99 dressing and found some markdown meat, too. I spent $12.25. I was at that Albertsons with the GF corndogs today. I was buying Lysol wipes and Kleenex and picked up the corndogs and some boneless, skinless chicken breast for $1.99/lb. I spent $12.82 on the food items. At November 1 we had grown our emergency fund to 53% of our goal. On November 8 we attended a charity event and were moved to make a donation, but decided to use our emergency fund. On November 12 my sweet father-in-law went home to Jesus and there were some expenses that came up related to that which were also covered by our emergency fund. We ended up down to 42% of our goal after those events, but the good news is that we were also still able to save new income and replenished up to 45%. So we'll keep at it. I estimate we'll be at least 47% and maybe 48% by the end of December. My big goal this month is to get my girls' clothes organized. I made the switch to fall/winter clothes, but the bins are still out in their rooms and I need to sort them more efficiently by size, season, so it's an easier come summertime. Wowee Groceries! I felt like I shopped constantly this week as I tried to score lots of sale deals. I went to Albertsons on Tuesday between therapy and well-child appointments for 2 kids. I found Twinings Tea on clearance for $1.00/box, as well as microwave popcorn for $1.00/box. Creamer was on sale for $0.99 and microwave dinners were $0.69 each. DH asked me to buy a few to have on hand when there aren't dinner leftovers. I also picked up bananas, pears, and carrots. I spent $31.89. I went to QFC with DD#1 on Wednesday. 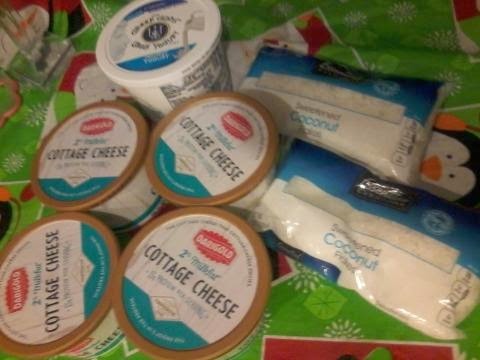 I wanted to pick up the 2# cheese for $5.99 and I found lots of other great stuff on clearance. Large organic yogurt was on clearance for $0.99, small cups were $0.29, $0.49, & $0.49. Neufchatel was only $0.49 each! 12 oz sausage patties were $1.99 each and hummus was $0.99. The broth was $0.50 each. I am using so much broth these days with the GF cooking that I decided I should be stocking up at the holiday prices. I spent $42.13. Next I headed to Safeway for the Rice Krispies on sale 3/$5. We were getting an oil change for the car on Friday so I took all 4 kids shopping at the Safeway next to the Jiffy Lube. I had lots of coupons to combine with the sale items and decided to spend the $35 to buy the turkey for $0.69/lb. 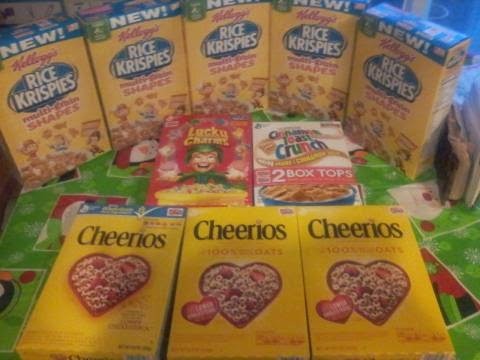 I bought 6 boxes of cereal in total for an average price of $1.25 each. 4# C& H sugar averaged $1.61, Chex Mixes were $0.75 each, Chicken broth were $0.46 each, evaporated milk was $0.73/each, 3# grapes were $5.00, and Pam were $2.49 each, Ritz crackers (for party trays) were $1.62/each, and I paid regular price for a cucumber and sour cream. Altogether I spent $55.24 including the turkey. On Saturday I visited Fred Meyer as I didn't want to miss out on $2 Martinelli's and the International Delight creamer for $2.00 after MC. I also bought 3/$5 Nabisco crackers and $2.00 ice cream. I spent $24.50 after coupons. I almost never go to Haggen, but I'm sure glad I went this week! I noticed, hidden on the back page of their ad, that Chex were on sale 4/$6! Of course I had to go get that deal as GF cereals are so limited. I scored some amazing clearance deals, too! Lunchmeat was on sale for $3.00 each (with purchase of 4) so I was delighted to find 4 packages with $2.00 off coupons. That made each 8 oz. package only $1.00 each! Next I found lots of dented cans in the markdown bins. 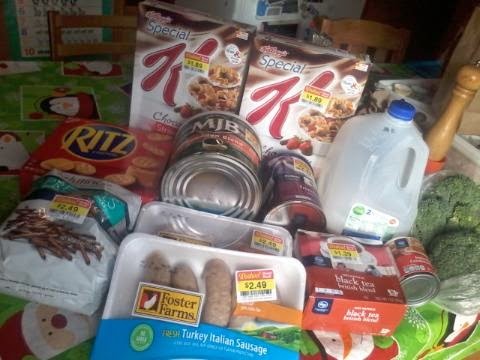 $0.22 for white kidney beans, $0.30 for 5 cans of green beans (hello Thanksgiving casserole! ), $0.28 black black beans, and $0.57 each for organic refried beans. I also got applesauce cups for $0.15 each. And I didn't get them into the picture, but I bought a dozen cans of olives for $1.00 each. The cereal was an average of $1.25 after sale & MC. Altogether I spent $29.89. I also went to Albertsons because they had butter on sale for $2.49. Finally, some butter on sale! They also had sales of $0.99 for 10# potatoes and $0.99 for 2# brown sugar. I also got 3/$5 crackers again and clearance donuts & cinnamon rolls (see photo below). I spent $18.69 at Albertsons. I also put $6.00 veggies in this photo that I got a Target. Here is a photo of the olives, donuts, and cinnamon rolls that didn't make it into earlier photos. The sales were so good at Albertsons I played hooky from church on Sunday morning to go to the Albertsons next door. I have only found the GF corndogs at this particular Albertsons so I bought two boxes, along with the $0.99 brown sugar, 3/$5 crackers, and $2.49 butter. I also got Coffeemate for $2.00 each after MC. I spent $34.95. Finally, I made one more trip to QFC. I was looking for a certain type of Pull-Up I'd seen on clearance earlier in the weekend and I found a package! Foodwise I bought a pomegranate, some more cheese, ground beef on clearance, and some lollipops for $0.49. Lollipops are such a good car snack because it keeps the kids occupied for a few glorious minutes. 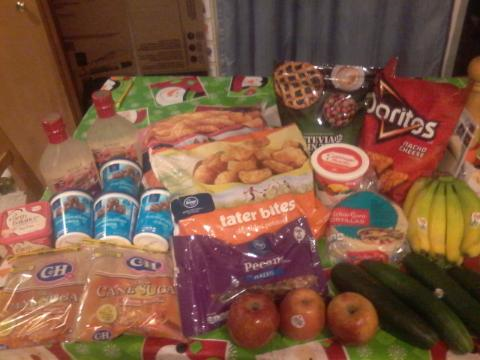 =) I spent $22.68 on food. Total Week 47 Groceries: $283.84!!! Weekly Average: $96.03 - a big leap from $91.95 last week! I hope I spend far less this coming week. I think the sales were just so spectacular approaching Thanksgiving I wanted to stock up. In particular, we use so much brown sugar, butter, and coffee creamer that I felt it would be prudent to stock up. So expect a much smaller week next week! I am not much of a Pinterest girl, but I sure like home improvement ideas. I clicked through something on Facebook last week and found a cool page with lots of neat ideas, some of which I'd never seen before. 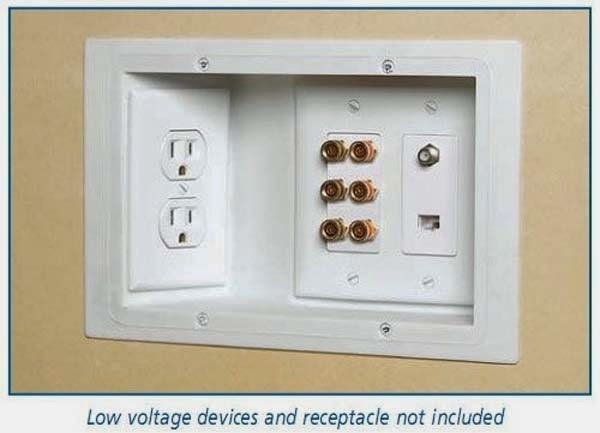 In particular I liked where some of the electrical outlets were tucked away and some ideas on using space between studs for storage. Some were impractical and NOT resourceful, but for the most part were interesting. I've been having trouble getting my camera to connect to my computer so no photos. Rats! And I'm behind in posting because we've been having internet trouble again, but I think it's finally fixed. Yay! I didn't shop until the weekend because I was waiting for my weekly household allowance that I usually give myself on Fridays. So I went to QFC on Friday while I had a sitter for the younger 3 and found lots on clearance. We got 4 packages of breakfast sausage links for $1.99 each, hummus for $1.99, a big organic greek yogurt for $3.49, an Adam's peanut butter for $2.19 and 8 bags of apples for $0.99 each. I also got a pomegranate because my oldest daughter just loves them and a package of lunch meat for $3.49. I spent $21.05 total. I also noticed GF spice cake mix on clearance and it was a kind I already had at home, but hadn't tried so I didn't buy it. Friday afternoon we made up the cake mix at home and it was delicious! So I went back late that night and bought the remaining 4 packages for $1.99 each - really a bargain considering the cost of GF flour and how fast it is to whip up some cupcakes from a mix! I also happened upon deli pizzas for just $2.99 each. Whoohoo! I bought 6 so DH would have easy dinners with the kids. I also bought 4 containers of GF pizza dough (makes 4 servings each for DD#2) at $2.49 each, some naturally colored jelly beans for $1.99, and bananas at $0.69/lb. I spent $39.13. On Sunday I stopped at Fred Meyer for a couple things. We were expecting company for dinner and I needed a couple things. I ended up spending $51.48! EEP! I always find so many great things at Fred Meyer. 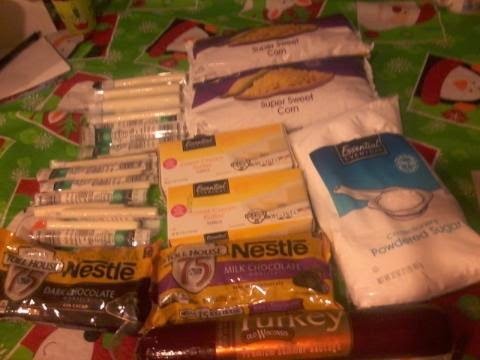 I bought ground sausage, brown sugar, a loaf of bread, parsley, 3 boxes of cereal, coffee, garlic, 2 creamers, a gallon of organic milk, 4 cans of olives, sour cream, clearance star pasta, and 2# shredded cheese. I stopped at another QFC to see if there were more GF spice cake mixes on clearance. No luck, but I did get clearance tomatoes. 4 bags at $0.99 each and about 9# total. It was $3.96. A couple months ago one of the kids knocked my mug of coffee into our Lego bin. After a few weeks I thought I should try to figure out how to clean up that mess, so I starting systematically cleaning the Legos in a lingerie bag in the dishwasher. Here's my bin when it was nearly empty. I realized as I got down to the bottom that an occasional wash might be a good idea just because of all the gunk I saw had collected. And NOT just due to the spilled coffee. Ewww. I used a laundry bag for the Legos in the top rack of the dishwasher. Initially I had the kids fill the bag every day, but after a mishap with crayons melting onto clean dishes I decided to fill the bag myself. Incidentally, it takes way more time to clean crayon wax off dishes than to fill a bag with Legos. It was really satisfying to see this sparkling bin though. And nice to finally put the Legos back in their home! Oi - I'm a day late in my menu planning. And wouldn't you know it we had dollar hamburgers for dinner last night (chili for my GF kiddo). Time to get back on the horse! What is it about fall and spending a ton on groceries? My aunt and I had a conversation last week about this. She shared that in her parents' generation it was common to have fall stock-up sales and lots of "case" prices on canned goods for people to load up in preparation for winter. We speculated that it was a holdover from our agricultural roots when food is harvested and stored to last throughout the year. When storms that stranded people at home were more common and we weren't so spoiled with a visit to the grocery store every couple of days. It was fun to speculate, but of course I don't really know why I keep spending so much. I think I just like to be prepared! First up Fred Meyer to pick up eggs & bread. My mama was coming to visit and she likes her breakfast. I found some GF crackers and cookies on clearance to try. I spent $27.95. Next I went to Albertsons to pick up GM cereal that was on sale and included Chex - finally! They were out of Rice, but I was happy with Corn & Apple Cinnamon. I found shortening and a sugar-free apple pie on clearance. I picked up bacon and Greek yogurt on sale. I spent $27.33 altogether. I popped into QFC for tortilla chips one day and found some dressing and sausage links on clearance. I spent $6.66. A different QFC yielded more clearance apples, another bottle of clearance dressing and clearance bacon. I also bought a bunch of pepperoni, and spent $14.93. The cord that connects my camera to my laptop disappeared about this point. So while I have photos on my camera, you don't get to enjoy them on the blog. DH and I had a big discussion about bulk buying chicken that resulting in my heading to Albertson's to ask about buying a case of boneless, skinless chicken breast. They agreed so I spent over half of my grocery money on 40# of chicken at $1.79/lb. I also picked up creamer, yogurt, nitrate free hot dogs for $1.49 each, 3 packages of chocolate chips in preparation for holiday baking and got a sweet deal on popcorn: Buy 1 3-pack of microwave popcorn, get a second and 2 - 2 liters of 7-up for free. I spent $96.43! I also spent $2 at Dollar Tree on imitation vanilla (I know, I know) and green tea bags. I was at Fred Meyer later that day because I realized I had forgotten to pick up Pull-ups and coffee filters. Gah! And of course, another trip to the store means another $16.35 on groceries. Finally, one more stop at Albertsons on my way to book club because I didn't allow enough time make an hors d'oevre and I ended up spending $11.17 on more chocolate chips and several items off the clearance bakery rack. Seriously, how could I resist 4 croissants for $0.99? Or 4 cinnamon rolls for that matter? Milk delivery was $12.87 and I finally hooked up with my friend for eggs (hooray!) and spent $10.00. I also am reducing my spending by $7.00 because I made a math error last week. Is there something special about plums that makes them more runny than other fruit? For the second year in a row my attempt at plum jam has made plum sauce instead. It's super yummy and folks loved it last year so I guess it will do this year, too. First I put 1/3 of the plums in the crockpot with about a cup of water. I counted them as I put them in so I would be sure to fish out all of the pits. DD#3 is an awesome little kitchen helper so as I scooped out each plum, she did all the pit picking. We dumped the next 1/3 of plums into the juice, let it cook about 6 hours and repeated the pitting. One more round and we were done. This is the plum pulp. I always think it looks gross, but whatever. It sat in my fridge for a week before I was ready to make the jam. I measure out 6 cups and it looked like I could double the batch. Sure enough, it was just over 12 cups. My pot was pretty full as I warmed it up. I added 2 boxes of pectin. I didn't like the look of the few skin bits floating around so I got out the immersion blender. The immersion blender is one of my favorite kitchen gadgets. See how much more smooth it looks after blending up the bits? Uh-oh. Time to add 8 cups of sugar. Will it fit in my pot? Nope. I had to get out my next-size-up pot. Once it was all cooked and boiled hard for a minute I poured it into hot jars, and sealed with boiled lids and rings. Finally, I ran them through the water bath with a 15 minute boil. After every jar had sealed with a satisfying pop (best part of canning) I labeled them with the date and "sweet plum sauce" since it was definitely too runny for jam. It made a little over a gallon. My mom is visiting this week - Hooray! This week was pretty average on the grocery shopping front. I went to Fred Meyer on Monday. I wanted to get some certified gluten-free hot cereal for DD#2. We have standard oatmeal & I think the trace gluten has been having a negative effect. At least I'm hoping that's what the problem is! The GF cereal was $3.99 but I consoled myself with knowing it's so very much cheaper than cold cereal. 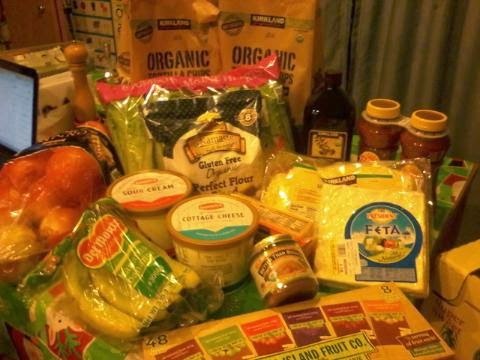 Other notable items - the 10# bag of potatoes was $2.48. I only needed a 5# bag, but it was $2.99! Of course I'll buy the 10# instead. Altogether I spent $36.29 at Fred Meyer. I stopped at Albertsons just to look for clearance deals on Tuesday when I was nearby. I'd been scoring some great deals on meat lately, but not this Tuesday. Rats. We got candy free with 5 cans of sale soup and decided to try a couple new GF snacks. The lettuce was $.99 on clearance. I spent $7.99 altogether. I went to QFC Wednesday on my way home from a kid activity. I scored major clearance produce - hooray! There were 3 bags of clementine oranges (8-9 each) for $0.99. I got red band bananas for $0.49/lb. And I got 9 bags of apples for $0.99 each. DD#1 and I weighed every bag to be sure it was over 2# so I know at most I spent $0.50/lb. We also found clearance bagels ($0.99), clearance frosting ($0.99) just in time for Christmas cookies, and clearance Caesar salad (for me). We also got taffy for $0.50 just to try it (GF). I spent $25.58 altogether. Finally, I picked up some carrots and beets as part of my bulk buy group. I spent $21.00. It was $7.00 for 5# organic carrots and $7.00 each for organic regular beets and Chioggia beets. I still haven't met my friend for eggs. Sad! I had a mountain of apples to can last week and kept putting it off because it was a huge job. It was just about 100 pounds altogether. We started at 5PM and all the girls were helping. This was our most common set-up: 2 youngest washed and passed apples to me, I cut apples and filled pots, 2 oldest took turns grinding apples as each pot was soft enough. The two youngest also filled the dishwasher with jars to be sanitized. One unloaded the jars from a box and rolled them to her sister to be put into the dishwasher. They were having a great time. Even a 4 year old can make applesauce! She was so excited to be up so late! This was about 9:30 pm. They were such good little helpers I let them stay up as long as they kept a good attitude. We listened to worship, the Frozen soundtrack, and classical hits while we worked. One girlie took a round of photos. Here I am in a rare photo appearance. My kitchen is a huge mess after canning this much applesauce. This is the trivet where the hot pots of cooked apples sit while being loaded into the grinder. This is one burner on my poor stove. The apple juices just make a huge mess. Bleh. But the finished product is always pretty impressive. We made 42 quarts! Our total for the year is now just over 100 quarts. We went through that by February last year so I'm hoping to get to make even more - depends on if I get any more apples for free or affordable enough.